Just off the M56 motorway, T2 Multi Storey West is 8-10 minutes' walk from Manchester Airport Terminal 2 check-in desks. Using this facility is fast and simple with no need to spend time checking in or queuing for transfer buses – just park your car, pop your keys in your pocket and take the short walk to the terminal. There's no need to worry about your car either, with the Park Mark Safer Parking Award-holding facility offering barrier-controlled entry and exit, CCTV and security fencing. 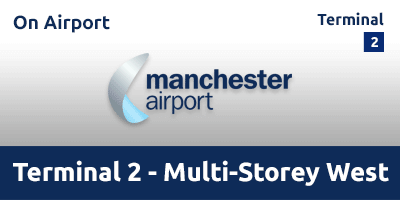 Perfect for anyone looking for a fuss-free departure day from Manchester Airport Terminal 2. This car park is 8-10 minutes walk to Terminal 2. There's no need to be concerned about your car's safety while you're away. Terminal 2 Long Stay is a facility that boasts security fencing and CCTV.. It is also a holder of the Park Mark Safer Parking Award. Spaces are available for disabled drivers on a first come first served basis and cannot be pre-booked. Please note that the Terminal is a 8-10 minutes walk. This car park operates 365 days a year, 24 hours a day. Maximum height is 2 metres. At the next roundabout, take the second exit into Palma Avenue, signposted for T2 pick-up. Continue past the terminal and T2 Multi-Storey Car Park and through a set of traffic lights. If the barrier fails to raise, please press the help button to call for assistance. Find a space and park your car. Head to the exit barrier. Any problems press the assistance button.